Dubai, UAE, October 07, 2018: The campaign of the Saudi Ministry of Health to raise awareness about breast cancer in Asir region, will be launched on October 10th under auspices of Al- Jazeera Paints, as its continues custom to provide social support. 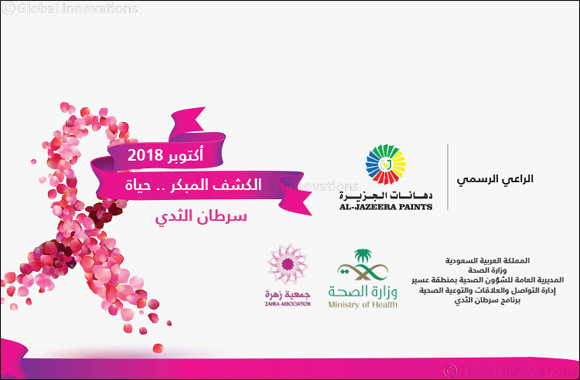 The campaign will begin next Wednesday at Al- Rashed Mall in Abha and will continue for five consecutive days under supervision of the General Directorate of Health Affairs in Asir through Breast Cancer Awareness Exhibition 2018, which was prepared by Al- Jazeera Paints in full. Many agencies participate such as: Asir Central Hospital, Sector and hospital of Ahad Rufaida, Shafa Abha Hospital for maternity and Children, the Directorate Health Awareness, Breast Cancer Zahrat Society and Al- Khamis General Hospital. The exhibition was provided with two clinics with a full medical staff to make a free examination for visitors, whereas they will be provided with several awareness leaflets, instructions, steps to breast cancer self-detect and the prevention of this disease God Willing. The exhibition also includes other public corners organized by the participating agencies, which provide awareness medical leaflets and provide various free consultations. The General Directorate of Health Affairs in Asir Region, urged the ladies to initiate early detection of breast cancer to avoid serious complications of the disease if found, Allah forbids and asked all to visit the exhibition and benefit from its free services to protect their health and increase their health awareness. Mr. Muthanna Ghaithan Al- Gerais, Health Awareness Management Head in Asir Health, expressed his thanks and appreciation for the efforts made by 'Al -Jazeera Paints' and for sponsoring this campaign.